Universa to be listed on Bitfinex and Ethfinex! THANK YOU EVERYONE FOR VOTING! WE WOULD LIKE TO THANK ALL OF YOU FROM THE BOTTOMS OF OUR HEARTS! 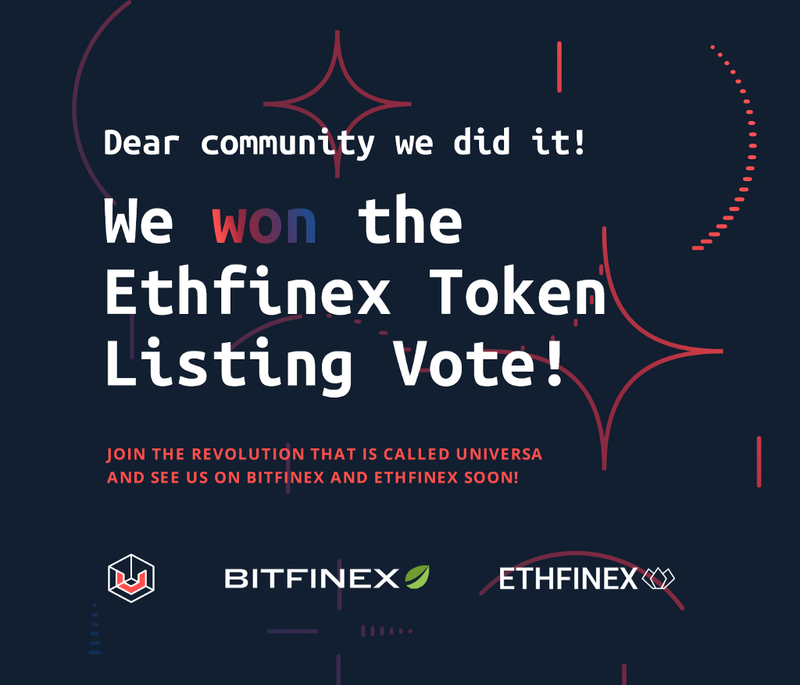 Together with all of you we won the Ethfinex Token Listing Vote! We can’t thank all of you enough for your active participation and engagement, your encouragement and enthusiasm but most of all clearly for voting for Universa! You will be able to see us soon on Bitfinex and Ethfinex! Keep an eye out in their Telegram chats for the listing announcement(s) and join the revolution that is Universa. The report addresses total trading volume and fees for August, combined with information of contributed ETH to the Nectar token contract which was pledged to NEC holders. Finally it also hosts a section with suggestions for future voting rounds, interesting stuff! Ethfinex offers a new community and information hub for ERC20 tokens and Ethereum-based projects. It will facilitate learning, discussion, and analysis whilst simultaneously offering access to the most highly liquid and advanced trading platform for ERC20 tokens and crowdsales. With the focus of Bitfinex on professional traders, new accounts will not be able to trade or perform any platform function until they reach a minimum account equity of 10,000 USD, achieved by depositing cryptocurrency. With the focus of Ethfinex on being a community focused crypto exchange, new accounts have no minimum capital requirements to trade or use the platform. Sign up for an account at https://bitfinex.com or https://ethfinex.com and you can always link your Ethfinex account to your Bitfinex account! Universa to be listed on Bitfinex and Ethfinex! was originally published in UniversaBlockchain on Medium, where people are continuing the conversation by highlighting and responding to this story. Older →August. Hot smart summer.